After seeing that his Thorndale result was compromised, Alec Castellanos quipped, "Maybe I shouldn't have stopped to take that picture on the Thorndale climb." Alec, we are all grateful that you did! 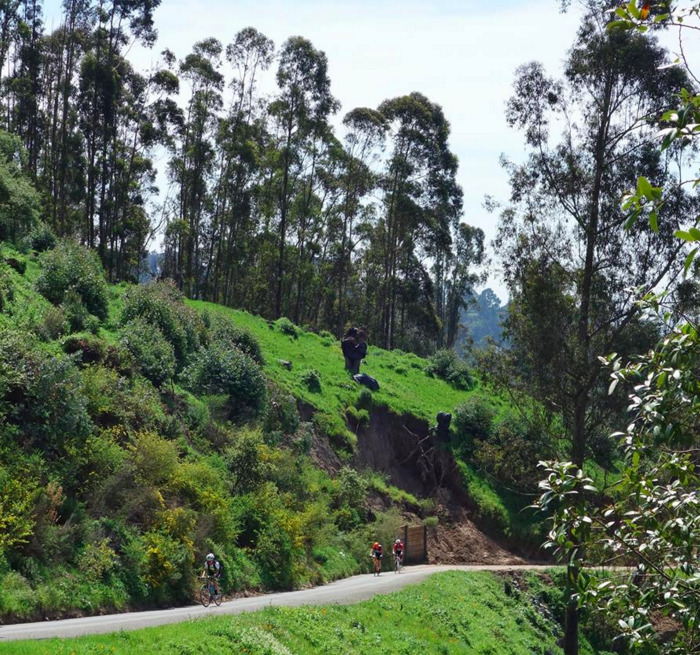 Beautiful photo of the Thorndale Climb! Well, the 15th Annual Nifty Ten Fifty is in the books, and what a great day it was! I want to start by making somewhat of an apology to all of you hearty souls. My personal life has been busy and challenging during the past year, and I confess that the Nifty didn't receive the level of attention that I normally would like to give to it. But the enthusiasm of the riders, and the fantastic weather, combined with the incredibly challenging course, put a smile on my face nonetheless. I'll be more attentive next year, that's a promise. This was the second year of the new course — the event has gotten big enough that I decided that the "small groups with guides" model wasn't going to work anymore, so I simplified the course in 2015. Now, before you start laughing and falling off your chairs, the new course has about 20 less turns and, believe it or not, is far more intuitive than the previous course. Nonetheless, last year I learned that most riders skipped the Canon descent, and the climb past the Merry Go Round in Tilden Park after the Marin climb. It just wasn't intuitive, and many people missed it, though we did need the 300' or so it added to make the 10K feet. So I re-routed the ridewithgps file, but forgot to update the route sheet I was passing out. Oopsie. For anyone who did the "extra credit," well, I owe you a beer, or perhaps a free entry next year... or a time bonus... or something. The extra credit was descending Canon and climbing past the Merry Go Round, vs. taking a right on Wildcat Canyon from Grizzly Peak. Last year, with the new course and self guided model, I had a start window of 8:00 AM to 9:30AM, thinking it would be good to spread the field. But by 9:15 AM, the start area was a ghost town, and Sarah and I started solo, and didn't see anyone for a long time. This year, I compressed the start window from 8:30 to 9:30. It helped, but we still had people raring to go at 8:00 AM, and we fought them off until 8:30 AM. Most were on the road well before 9:00 AM. Next year I will narrow the start window more, and start earlier, by opening registration at 8:00 and having the official start at 8:30. Arielle Little, one of the top Women finishers of the day grinds up the final 26% pitch of Marin Ave.
Riders rolled out in perfect weather, cool and comfortable for hard climbing. My group started at about 9:35, well behind most. Some of the faster riders forged ahead while a few dropped off our intermediate pace. On Moeser, my friend Tom Williard hit and object and had a sidewall blowout. Tom had done the first five or so Niftys back in the day, then took a one decade hiatus. I was thrilled to see him back but was devastated that his ride would end in the first half mile. But in Nifty spirit, Tom booted the tire with a $20 bill, thinking it would hold better than a $1, and proceeded to finish a good bit of the course, finding my group at Peet's Domingo, and executing the final climb with my group. True Nifty Grit. There is no point in going through all of the details of the climbs — most of you were there. But I cannot tell you how much I enjoyed this ride, and how great it is to see so many people willing to tackle this huge and unique cycling challenge. Our group was able to catch up to many riders on the course and we had a wonderful stop at Safeway in Montclair, consuming such delectables as sodas, chips, salami, sushi, and sandwiches. Liza Hartlaub puts in a fine performance at the top of the Thorndale climb on Elverton, passing Sarah Schroer in the last few meters, though Sarah started the climb after Liza and hence had the faster time for the entirety of the climb. People come from all over the Bay Area to test their mettle on the Nifty, always a good turnout from the Fremont folks, which I always appreciate, and others from SF and the North Bay. Thank you all for coming. How can you not love the spirit of riders showing up for the Nifty on full Rando steel bikes! Bryan Kilgore and Therese Cools. After a break at Peet's Domingo, we made the final push up to Vollmer Peak, where we had a good group of folks gathered. Thank you all for coming out and making the Nifty such an epic event! Quintessential hard man and overall winner Bill Laddish. I love this guy. He has such a great spirit and competitive drive, and he really is a nice guy! Congrats, Bill! Mr. Nifty with Tom Williard. Tom did the first five or so Nifty's and has a Marin Nifty Title or two in his trophy closet, before the days of Strava. So nice to see him back after a one decade hiatus! Mr. Nifty is honored to pose with the second place overall woman, Sarah Schroer. Sarah had a good contest with climbing ace Janet Gardner, who was the overall champ. Bernard Demai, who is pushing 70 and completed the Nifty mid pack sent along this photo of his riding buddies. 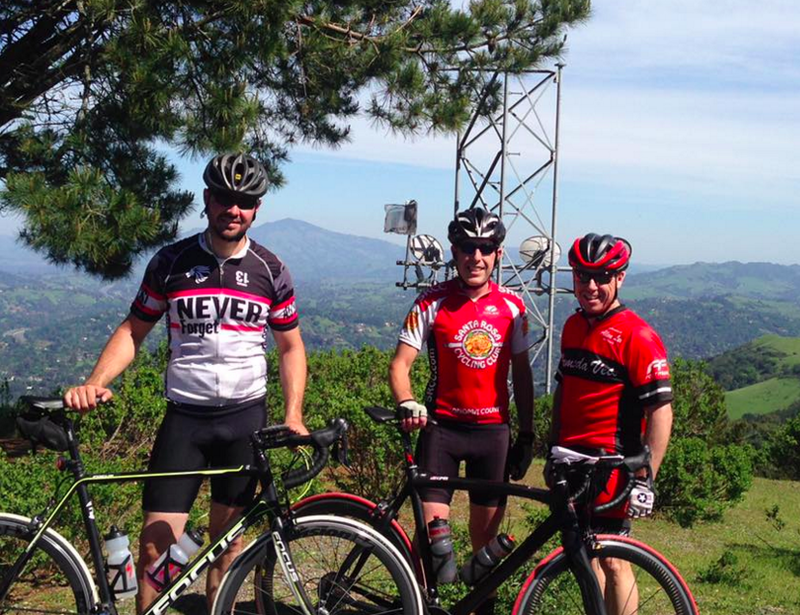 In center is Vernon Picconotti, a Santa Rosa Cycling Club Member. The rider on the left is wearing the Paul Stimson "Never Give Up" Jersey. Paul was an avid cyclist dedicated to helping others. He died last year of ALS. Last year's Nifty was dedicated to Paul. Results are below. We had three rated climbs this year. 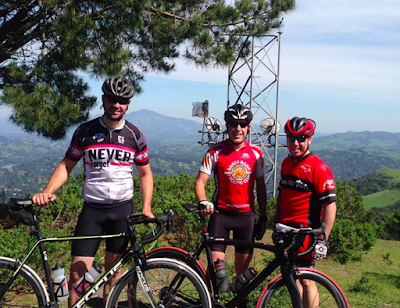 Marin, Thorndale, and the final big climb of the day, Claremont/Grizzly/Vollmer. Remember, if you haven't gotten enough Nifty-ness in your life, the Nifty Mixty is scheduled for April 23. In this also unique event, all riders are timed on segments, and rated with age and gender compensation. It is a "gravel" event, meaning you will need a road bike with sturdy tires, a cross bike, a gravel bike, or a mt. bike. Your choice. Stay tuned. Overall results for Women. This title was calculated by taking the sum of the placings among women for 3 selected climbs, Marin, Thorndale, and Claremont/Grizzly/Vollmer. Marin and Claremont/Vollmer/Grizzly Count as double. The lowest possible score then, for winning all three climbs would be 2 + 1 + 2 = 5 points. Riders needed to complete the entire ride, more or less, and all three climbs. Additionally, you needed to have signed a waiver at the start in order to be an official finisher. Note that Sindy Cho was poised for a third place finish, as indicated by her first two times, and almost complete time on the third climb. She failed to make the trip to Vollmer Peak unfortunately, so is not listed in the results, but nonetheless deserves kudos for a mighty strong ride! Janet Gardner and Sarah Schroer had a close competition. While Sarah took Marin, Janet won the latter two climbs to clinch the title by 1 point. Arielle Little was just a bit behind Sarah and Janet, with Sindy taking some precious points away from her. Liza Hartlaub and Tara Kurihara had a very close competition, although they probably had no idea, since they were riding far apart. Overall results for Men. This title was calculated by taking the sum of the placings among Men for 3 selected climbs, Marin, Thorndale, and Claremont/Grizzly/Vollmer. Marin and Claremont/Vollmer/Grizzly Count as double. The lowest possible score then, for winning all three climbs would be 2 + 1 + 2 = 5 points. Lower score wins. Riders needed to complete the entire ride, more or less, and all three climbs. Additionally, you needed to have signed a waiver at the start in order to be an official finisher. Nifty vet and consummate hard man Bill Laddish took the win, although Hanns Detlefsen had some super fast times on the second and third climbs. Hanns chose to take it easy on Marin, which allowed Nifty vet Bill Laddish to take the top overall honors. Ben Knipe put in an amazing performance, 3rd on the first two climbs, then crushed the big one at the end for 2nd place. This consistency left him with a second place overall! Amazing when you consider that Ben is a big lad! He is a remarkable climber for a big man.